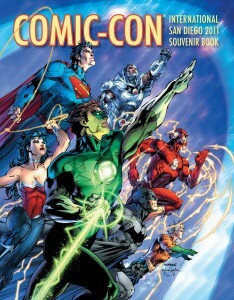 Comic-Con has opened submissions up for their 2012 Souvenir Book. That’s right, if you want your work in that fat book of pro-level fan art collection they sell each SDCC than now’s your chance to submit. Sell. *sigh* Raise your hand if you remember getting the Souvenir Book as one of the freebies in the bag you got when you bought your ticket. *surveys raised hands* Good, now I’m not the only one feeling the time. The 2011 commemorative book had a Justice League cover by Jim Lee. I’ve heard it called “beautiful” (mainly by marketing text) but, frankly, it’s just “okay”. I mean, seriously, it featured Green Lantern doing some sort of odd advanced yoga pose and the Flash running in place with a random Batman torso connecting them. And just where does Batman’s fist and Aquaman’s thigh diverge?! And they all appear to have different headings that will result in everyone colliding in the middle. The coloring was nice, though (go Alex Sincalir – LOVE his work, and tutorials). SDCC has put out an open call for submissions for its 2012 Souvenir Book. Since it is soliciting artwork and articles that means that, yes, you can totally send them an entry. There are a few rules and guidelines you’ve got to follow, though, in order to be considered. And by “be considered” they mean make it past the volunteers who will be vetting submissions for just that and likely ash-canning all that fail to meet the rules. And doubtless a certain taste level. You HAVE to meet the deadline, which is April 20, 2012. Submissions need to be 15 MB and below in size – they prefer email submissions. Send your entries to this special e-mail address, ccisouvbook@comic-con.org. Yes, you can mail a submission. But, again, SDCC prefers to get entries via email. That means they want you to email it to them. AND, lastly, your artwork or article needs to be about one of the particular themes SDCC has chosen for the 2012 Comic-Con Souvenir Book. For full details on the themes and the exact guidelines for the various submissions, see the SDCC Souvenir Book page on Comic-Con’s site. In addition to glory, successful entrants will also get a FREE copy of the 2012 Souvenir Book. Free. *sigh* It’s a long way back to ’92.